With me today is Herb Smith who has been doing a blog tour with Great Escapes Virtual Book Tours for his new book THE EGGSTONE MURDERS. Herb was born and raised in Iowa and he and his wife, Glenda, now live in Eugene, Oregon, where they retired several years ago. But in between he has lived and worked on four continents and many different countries. His previous books include: Cairo, The Mother Of The World, Crossing Borders, The Great Sphinx Of Amun-Ra, Songs Of Saints And Angels, and The Names Of The Days – A Novel Of Egypt’s 2011 Revolution. Today Herb will be giving away an ebook copy of The Eggstone Murders – just leave a comment with your email address and for more chances to win, go HERE. I’m very glad to have you here Herb. You’ve travelled to quite a few places and lived in some of them, other than where you are now, if you had a choice, where would you live? I’ve always loved Cairo – since I was there in 1990’s, anyway – and that’s where I would choose to live except for the current political situation. Until very recently, when the military removed Morsi, I thought it would be safe there, but now it isn’t, so I need to decide on another alternative to life in Oregon. I suppose I’d like to live in the Middle East somewhere, and Dubai in the UAE comes to mind, but it’s very expensive. My next choice would have to be somewhere in or near Jerusalem, another not-so-safe place, but I love it there. Not because of religion (too conflicting) but the climate is healthy for me and I love the eastern part of the city where the Arabs are the dominant population. I’m used to living in an Arabic community, and I like their friendly, easy attitudes. Well, I worked in Egypt and Qatar as an English Language professor. My life in the Arab world was intense and lengthy – five years plus – so I have an idea about the way it works for expat men. Women are an entirely different issue, I know, and my wife didn’t live there with me for that reason. She would come to visit but wouldn’t stay. Toward me, Arabs were very hospitable and mostly friendly and happy. I know they are, Herb. I just give my poor husband a hard time. So how did you start writing? I am a linguist and was an English language professor. I just love language and love to write, although I don’t think my own work is truly great. That’s an honest evaluation, and it’s borne out by the evidence that many people seem to like my books, but they will never be on the ‘best seller’ lists. I also love to meet and talk to people, and I enjoy different styles of language and find pleasure talking to all kinds of folks in various places. I injured my left arm in an accident several years ago, and it didn’t heal. I can still use it, but it’s limited now, and I have increasing difficulty getting its cooperation. I started writing a lot more after that. I had written a couple of musical plays before, but books are a new interest, and they now take my attention. This book is quite a departure from your other books. What brought about this change in genre to Cozy Mystery? Where did the idea come from for the book? One of my sisters wanted me to write about our childhood and young-adult life in Iowa. This, however much a departure from the actual life we had there, is my response. I wrote about the things I recall fondly as well as the fictional aspects of the story, and those fond recollections are the heart of the book(s). My interest in writing mysteries stems from the fact that my wife loves the genre – as do many friends. Recently, I have read many mystery books that my wife recommended and found that I liked a lot of them as well. I still don’t care for the so called ‘hard-boiled’ kind of story. I have no idea. I’ve never thought about it. Somewhere, I can’t recall where exactly – I wrote that ‘I am Guy and he is Me.’ I made him myself – the way he looks, anyway – as an anti-hero and as a joke for my books. It was a simple, fun thing to do. So when you see my picture, you see Guy. I kind of caught on to that reading the book. Which I enjoyed, by the way. You know who would have been perfect to play you – I mean Guy, too bad he’s passed away, Denver Pyle who used to play Uncle Jesse on the Dukes of Hazzard. So how long did it take you to write the first draft of your manuscript? I am a little embarrassed to say it, but in its original form, start to finish, it was about two months. Too short a time for much of a book, people think. My other books have taken months, or in a couple of cases, a year or more. But this and the subsequent others in the series, are written very rapidly. Then, there’s the editing and re-writing, which takes much longer! I am a musician and I play the piano for diversion as well as focus. I retired from church music (organist) not long ago, after fifty plus years, and now play piano as a volunteer in a hospital. For fun I work on duos with a cellist. What are you working on now and what are your future writing plans? I’m currently working with Guy et al on another Starfire book. It’s great fun for me. In future I plan to do at least one more ‘Starfire’ set in Hillville, and then I want to go back to Egypt and maybe write a mystery set in ancient times. Or I could follow my first chapter of The Great Sphinx of Amun-Ra and write more about Gan and his friends. Ancient pre-history is a preoccupation of my mind. What is your favorite food? I like Italian and German – I am of German descent – and Middle Eastern. What is your favorite TV show? I rarely watch TV. Too busy with music and writing. What is your favorite music? I like classical music, especially choral and piano concertos. The singIe piece of music I love most –I can listen to it for hours – is ‘How Lovely Are Thy Dwellings’ from Brahm’s Requiem. I have a friend who loves indie rock music and I read his blog and listen to some of the music. I’m learning a lot, and may come to a greater appreciation of that genre some day. You would have enjoyed eating at my house last week, my husband went a little crazy in the Middle Eastern Market. We started with kibbee nayye last Sunday and since then it has been Middle Eastern every day. I want to thank you so much for being here today Herb, and good luck with the tour and your new book. And if you ever visit New England,you’ll have to drop by for a meal – I make a Toum that will knock your socks off. Before you go, is there anything else you would like to tell your readers or have them know about you? Thanks for hosting my book on your blog. I am also pleased that you like the story. I hope the fun I had writing it is obvious. I am on Facebook and Twitter, although not very active. But I plan to pick up the activity – and I would enjoy hearing from readers there. I’ve been sort of ‘off’ for a little while – a small surgery that turned into a lot more. Anyway, I’m mending, and I can use my arm a little better, which helps with the computer activity so stop by. Kate has all my links down below. It’s 1952, and Jerry Snowland is leaving Chicago to lose himself in the folds of the Loess Hills in Southwest Iowa. He’s headed for the little county town called Hillville, where he will start a new life as Guy LeFevre; a little devious, a little arrogant, and a well-disguised embezzler. But that makes no difference, he is really a decent guy beneath all that, and he plans to live a quiet life in the country for many years to come. That was his plan, but reality intervenes, and Guy becomes a detective, quite by accident, and helps solve a couple of murder cases in the process. 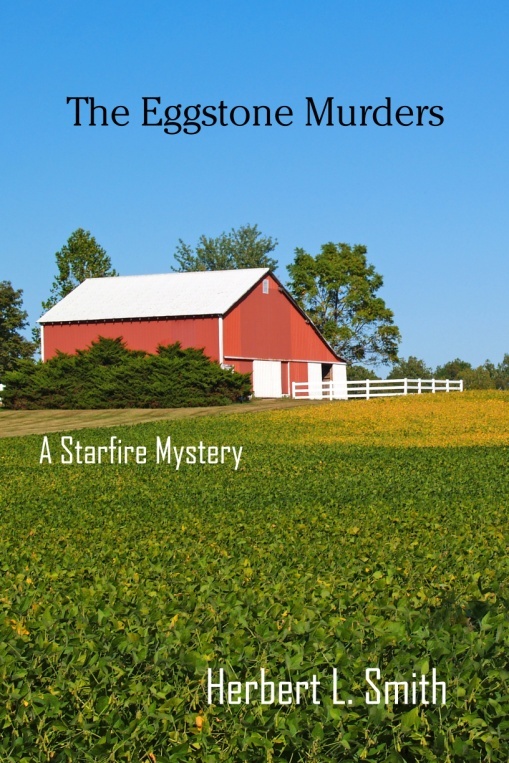 An inept sheriff, a likable young man named Caleb Starfire, and a variety of zany characters populate the story of Hillville and Eggstone Farms, where the murders take place. To add to the fun, Hunky Ham’s Pig Palace seems to be everybody’s favorite spot for lunch as well as other, less wholesome activities. Few places around town offer such exotica, and clients travel to Hunky’s from all over the area, especially after hours. But Hillville is mostly wholesome; a picture of 1952 as though time has been forgotten, and a ride through southwest Iowa on a summer day, storms and all. I enjoyed this book. It was an easy read – by that I mean, easy going, soothing, taking me back to a time and place I don’t know but think I like. I suppose it has been so long since I read something without a cell phone in it. I should do it more often. The character of Guy is a man with a past. He’s reformed but not until he scored enough for a comfortable retirement where nobody knew the old him and he can relax, grow a beard, eat a lot and get fat. But it doesn’t work quite that way. He meets up with taxi driver Caleb who has dreams of becoming a detective. Guy finances the startup of the Starfire Detective Agency and Caleb is soon off on his first case with Guy as backup. Which he needs. Caleb is a little rough around the edges and can be a bit excitable. There is a lazy and not too bright sheriff which makes it easy for Guy to figure things out without interference and also to decide who receives punishment for their crimes – and who doesn’t. This is a perfect read for a lazy sunny day, sitting in the shade, drinking lemonade. This sounds like a really good read! I love books set in the 1950’s. I was 5 in 1952 (until I turned 6 in Dec) so can’t really say I know that time frame. But I think it would be an easy time to read about — as you said, no cell phones — & people friendly and easy goin’. Sounds like a book I’d enjoy reading. I love to read most anything. Book sounds wonderful. Love small town mysteries. Thank you for the chance of a giveaway.